In the distance, past the trees and houses of picturesque Langley, the sparkle of Saratoga Passage beckons. Past the water, the pines of Camano Island rise, providing a frame for the place where gray whales come to play. Words cannot do justice to the idyllic view, yet words are exactly the foundation of Mary McLeod’s art. 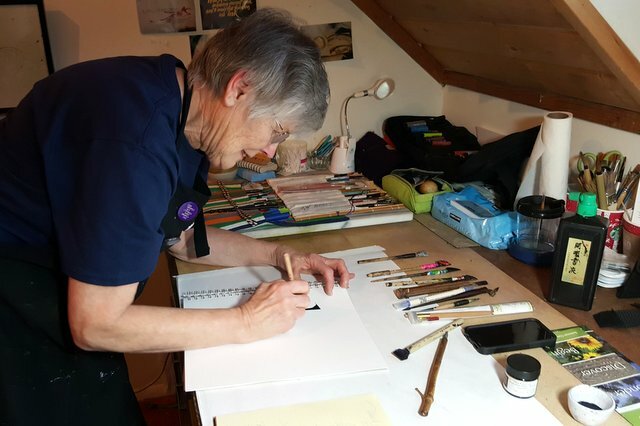 McLeod is a calligraphy artist who has called Langley home for the past forty years. Her career has been spent teaching, first as a music teacher over “in America” and then as a visual arts teacher for the South Whidbey School District. Yet, in all her career, it was an incidental two-week seminar that changed her artistic passion. The history of calligraphy is as old as the history of writing. Books were once handwritten and hand embellished by expert scribes. The calligraphic arts extended beyond the words and letter forms to include decorative motifs and illustrations with colored and gilded Illuminations. Yet, as is often the case, technological advances all but killed calligraphy when the printing press came into use. Near the end of the 1800s, around the time the village of Langley was founded, Great Britain’s William Morris took a new look at old world calligraphy and realized that the writing was made with a broad-edged instrument rather than a pointed pen. He also realized its value. Edward Johnston, called the father of modern calligraphy, carried on the work of Morris and ushered in the revival of this elegant art form. In 1976, McLeod attended a seminar taught by Professor Lloyd Reynolds of Reed College in Portland, Oregon. Reynolds is credited as the man who brought calligraphy to the Pacific Northwest, and he is certainly the man who instilled a life change in McLeod. From that one seminar, she was hooked. Her passion for this old and beautiful art steeled her resolve to learn all she could and master the techniques. 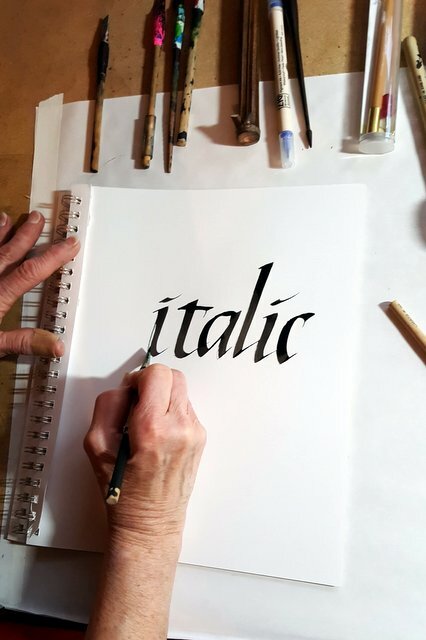 “You don’t give up on anything,” she says, “If it’s something you want to do, you find a way to do it.” This led to a succession of calligraphy teachers and years of practice and discipline. 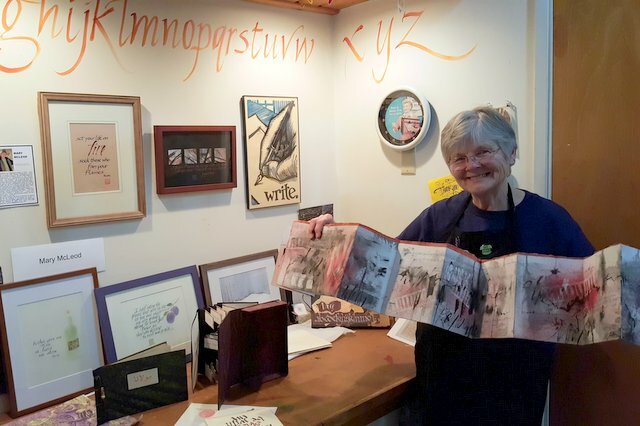 Her studio in Langley is adorned with examples of the many base types of calligraphic form and samples of her work. Part workspace, part gallery, her “tree house” is a place of refuge and art. The tools of her art form rest in display across her main desk. Across the top of another desk, handmade folded journals stand open. They tempt investigation to learn what awaits inside their accordion folds. In a second studio room, candles flicker from within luminaries adorned with McLeod’s calligraphy, drawings, and embossing. The lanterns, hand-made by McLeod, cast a warmth to the room with their amber glow and messages to “sister and mother Earth.” McLeod’s eyes share that same glow when she talks about calligraphy. At one gathering of fellow calligraphers, group members were challenged to use their skills for a cause they believed in — to become activists. 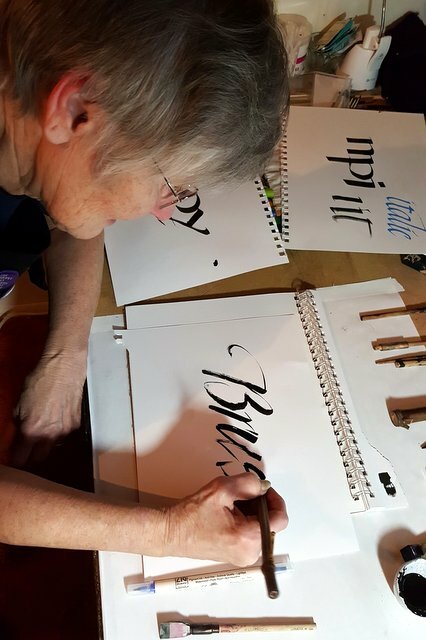 “I wanted to be an activist scribe,” to promote the art of calligraphy, she says. So, she set about sharing her art wherever she could, including store windows, shelves, cards to friends. Her work, and the work of others like her, has paid off. In recent years, calligraphy has enjoyed a resurgence in popularity. With that has come new, modern forms of calligraphy that are trendy. McLeod hopes, though, that this interest will lead people to learn the foundation styles. You must learn to do it the traditional way before you can create your own style, she says with a knowing glint in her eye. It is the look of experience. McLeod is a living example of “once a teacher, always a teacher,” and that desire to teach has come back. Soon she will be offering classes in her own home studio. 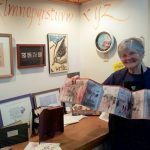 She will be teaching embossing, stamp making, drawing, journaling, luminary making, and of course, calligraphy. Anything she knows how to do, she will offer others the chance to learn. Until then, you have the opportunity to see McLeod’s beautiful art first-hand at the Whidbey Art Gallery in Langley. McLeod has been a full, juried member of the Whidbey Art Gallery since September of 2014. There, you can both view and purchase her creations. The Whidbey Art Gallery is also the place to go if you are interested in taking a class with McLeod. 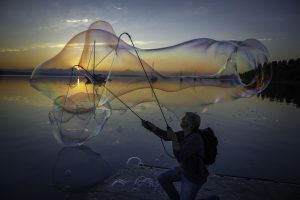 It is rare for visual arts and the written word to share space anymore. That place where poetry, the thoughts of the mind, and the images of the heart converge is now elusive. McLeod has found that place. View her work at the Whidbey Art Gallery and find illumination.